Enjoy your vacation in this beautiful Bear Lake Log Cabin. 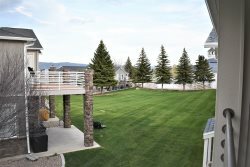 Spectacular views and unbeatable accommodations make this the perfect place to stay in Bear Lake! Come play with the bears in tons of green space for playing on yard, large slide for the kids, Basketball court, Pirates Cove a indoor playhouse, all with gorgeous gardens and more. Note: This unit has free Wi-Fi!!. Free Wi-Fi is also available at the office.